This is my Steampunk lamp Diabolical Box #125 I call it The Elegant Machine. At 27" tall this is my largest Diabolical Box to date. I found this very cool box from India and the holder from an antique world globe the two just seemed to naturally go together. 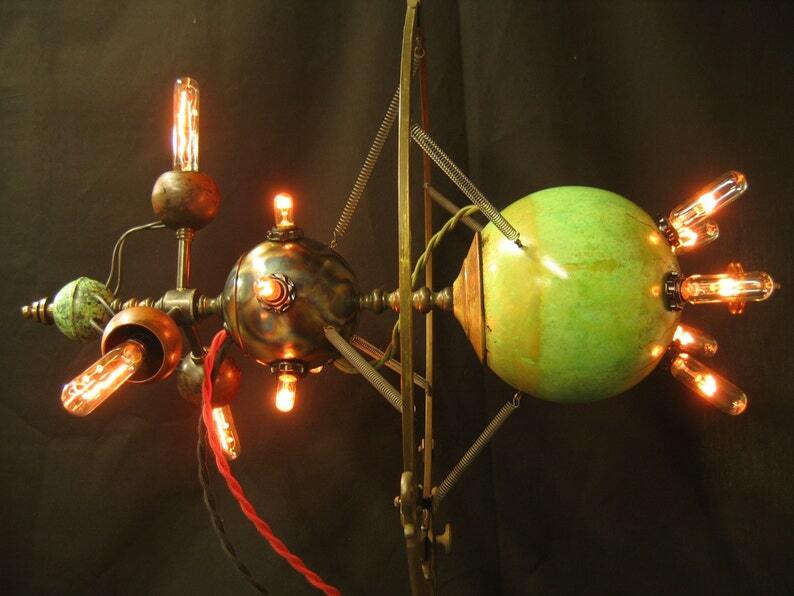 The light globes are suspended on springs and with a push they jiggle. Vintage and re-purposed parts include: Wood box from India, antique globe holder, brass lamp part, and clock gears. Front gear is a dimmer, and key on the top is a three way switch. The box is sealed closed to prevent access to the electrical connections. One thing I most enjoy doing on the lights is creating the patinas on the light balls. The balls are either brass or steel and the patinas are all done with chemicals in various combinations and techniques. The patinas are all sealed and stabilized with clear acrylic. The power cord is twisted black cotton. Mounted on the side of the box is a brass plate with the number of the box stamped into it. My signature, name, and date are carved on the bottom of the box. All my Diabolical Boxes come with a light dimmer. The gear on the front is the dimmer and the key on the top is a three way switch. You can use it to dim the lights to an eerie glow. The light bulbs I use are easily available on the internet. I supply a list of web site sources for all the bulbs I use. Bulbs: Five 15-watt bulb candelabra base T-6 showcase bulbs, three 25-watt t-9 showcase bulbs, and five t-3 pilot bulbs all on a dimmer. I only ship on Wednesday and Friday. I do not ship the next day and but guarantee to ship within ten days of payment.